Miss Foodie is our newest blogger, here to tantilise your taste buds. Join her on her gastronomic adventures each Thursday. It's pretty simple….I love all things food! For as long as I can remember I have been drawn to food. Food simply brings joy to my life, without it I would be lost. Often cooks and chefs talk of growing up in cooking oriented households; reminiscing about how magnificent their parents' cooking was, mine too was much the same. I was exposed to a diverse range of flavours as a child, both at home and travelling. Our family fridge was never without olives, pate, gherkins, numerous cheese varieties, salty plums and salted liquorice (can you tell my grandmother's Dutch?). Having lived in Darwin's Northern Territory until I was 9, the Mindal Markets were a regular family and friend Friday night outing. While the sun set over Mindal Beach, we feasted on BBQ sate with peanut sauce, BBQ Fish stuffed with Mango, Vietnamese coleslaw, Lebanese meatballs, venison sausages, rice paper rolls, beef rendang, the list goes on. There is no wonder Asian cuisines quickly entered my Mum's cooking repertoire and why today Vietnamese is one of my favourite cuisines to cook, and even more so, to eat. I've always enjoyed watching a myriad of cooking shows; I've cooked hundreds of dishes and read a diverse range of cookbooks. In early primary school, I loved cooking shows more than I did cartoons. I remember when Mum allowed me to bake a cake for the very first time. I was in year 6 and I baked a Double Chocolate, Rum Cake. The recipe came from an infamous Women's Weekly cookbook I believe. It had fluffy fresh whipped cream on top and I sprinkled it with a dark Cadbury Chocolate Flake bar. Mum was most impressed, so much so that whenever we visited a family member or friend from then on she would always say "Why don't you give that yummy cake a try again darling". The seed had certainly been planted. The joy I get from cooking; especially for the people I love, will never fade. If you love food and life as much as moi'! Then join me, Miss Foodie on my delicious adventures. For my first recipe I had to go with an Asian dish, it is my favourite cuisine after all. 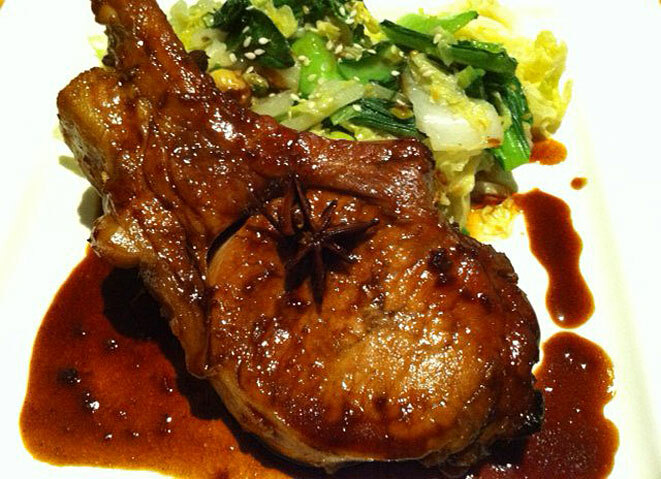 Asian pork with wilted Asian greens is a meal I often cook at home. It's super easy and packed with sweet sticky Asian flavours. My partner isn't the biggest fan of star anise so I sometimes remove this ingredient from the meal; feel free to do the same if you too aren't fussed on star anise. I have used both pork cutlets and chops and both work well here, just be careful not to overcook your pork otherwise it will dry out. Happy eating my foodie friends. Combine sugar, 60ml (1/4 cup) of the tamari, star anise, ginger, vinegar and oil in a glass bowl. Add the pork and turn to coat. Cover and place in fridge for 3 hours to develop the flavours. Preheat oven to 220°C. Remove pork from marinade and place in a roasting pan. Reserve marinade. Bake in oven for 20 minutes or until pork is brown and cooked through. Transfer to a plate. Cover with foil and set aside for 5 minutes to rest. Meanwhile, combine reserved marinade and water in the roasting pan and bring to the boil over high heat. Cook, stirring for 5 minutes or until sauce thickens. Add the remaining tamari and stir until well combined. Remove from heat. Heat a wok over medium heat. Add the sesame seeds and cook, stirring, for 1 minute or until toasted. Transfer to a plate. Add the gai choy, choy sum, cabbage and green shallot to the wok and stir-fry for 2 minutes or until just wilted. Divide the Asian greens among serving plates and sprinkle with sesame seeds. Top with pork and serve drizzled with sauce.